December can be a long list of Christmas to do’s. And it’s not just the shopping, gift wrapping or baking that needs to be done for an excellent morning. No, its a month long where there are Christmas parties to attend and throw; where there are friends and family to reach out to and to create new memories with… It’s a full month of people reaching out in ways that they may not have in the last 11 months. And when a month like that is jam-packed, it’s easy to let a few things slip through the cracks. If you are planning on throwing any parties or having any house guests during the holiday season, it may be in your best interest to consider how your whole house is affected. Yes, you will want to make sure that you declutter and maybe consider adding a coffee station to your home. But there are a few things that, if left unconsidered, could lead to more significant problems. When you have more people over staying with you, your whole house gets used in ways that it usually doesn’t. Meaning that your toilets, sinks, showers, dishwashers, disposals, and pipes are all getting a workout. We recommend taking a good look at all of your appliances and find out if anything is not working in tip top shape. Have you noticed a leak under a sink? Is a faucet not working correctly? Does your water heater make a popping noise when it is turned on? Are you noticing that your drains are backing up on a regular basis? If issues like these are not being addressed, the problems may only be exacerbated while during high use over the holidays. We would love to come to your house before all of the guests arrive and help make your home holiday guest ready. We always recommend having your sewer lines checked. Tree roots can cause some severe damage if they have gotten into your pipes and can create severe drainage problems. Also please note that if a plumbing emergency should happen over the holidays, we never charge extra for those calls. We know that no one plans on that happening and we would never want to add any additional stress to you or your family. 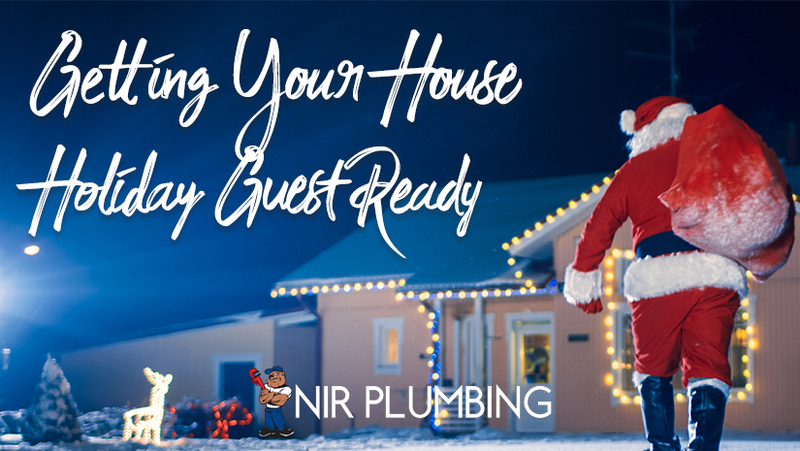 Please call NIR Plumbing for all of your holiday home prep needs.